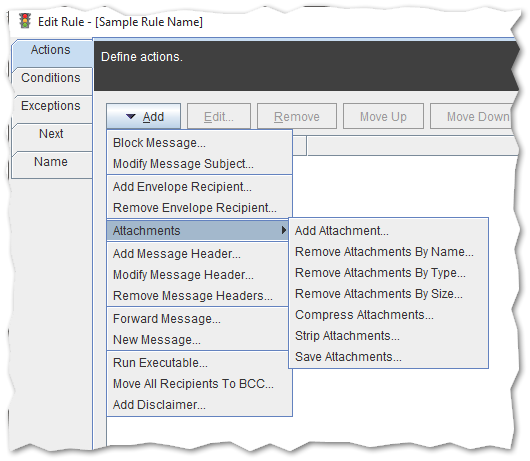 To create a rule which will block or modify a message click the Add Rule button on rules group node. 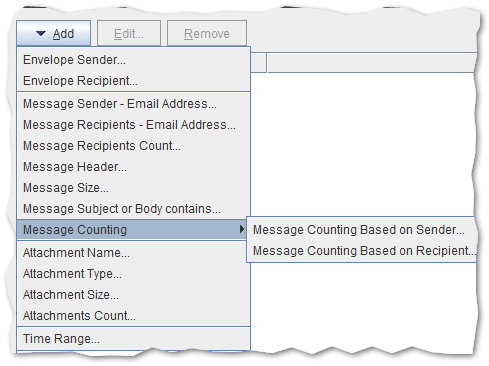 This brings up the rule wizard, where you can configure conditions, exceptions and actions for messages. On the Actions tab you can choose from variety of predefined actions what you want to do with a message. More detailed information about each action could be found in Actions section. In the Conditions tab select what message properties trigger actions. Click the Add button to insert a condition. More detailed information about each condition could be found in Conditions and Exceptions section. If more than one condition is defined you can decide if the message must meet all or just one of them to execute actions with the Execute actions when option visible at the bottom of the wizard window. On the Next tab you can choose what to do when rule is applied and what to do when rule is not applied. 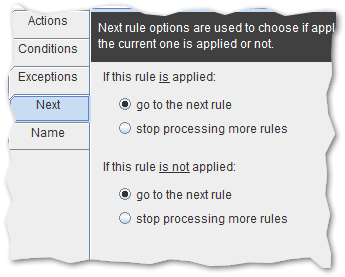 There are two options to choose got to the next rule or stop processing more rules. 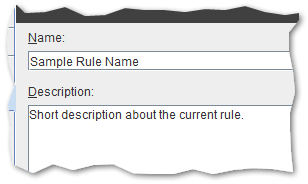 Finally you can edit the name and description of your rule in the rule Name tab. Click OK then Save All button. That’s it - your rule is ready to work.